Every home, office and motor vehicle should have one of these. 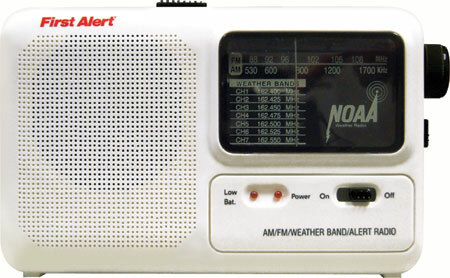 The portable AM/FM Emergency Radio gives you the life-saving advantage of an early warning before severe weather and other emergency conditions arise. The early warning system receives emergency messages from the National Weather Service on the NOAA weather band. Receives all 7 NOAA broadcast channels 24 hours a day - 7 days a week. Alsso has the AM/FM bands for the latest news. Features an automatic loud alert tone for emergency conditions in your local area. Operattes on 120V AC/DC adaptor or on 4 AA alkaline batteries for emergency situations, The Portable AM/FM Emergency Radio measures 4 1/2" high X 7 1/2" wide X 1 3/4" depth.